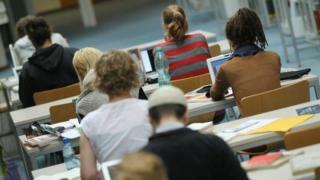 The dropout rate for students at Scottish universities is the lowest it has been for 19 years. For the first time in a generation, the retention rate for students is better than the UK average. Alastair Sim, director of Universities Scotland said the improvement in retention in Scotland was a cause for celebration. "The sector and individual institutions have dedicated significant time and effort to ensure that students get the most of their studies and time at university," he said. "Retention is such an important part of the task of widening access. Universities' goal is to support students to achieve successful outcomes and that's a much bigger and more meaningful responsibility than just getting students into university. "Unplanned exits from university can feel like a really big setback for students. "We will take heart from today's figures but we know the work to improve retention will continue at all our universities with continued investment in student support, creating a welcoming campus for students of all ages, background and experience."